Today we visited Winscombe Care Home in Fareham. 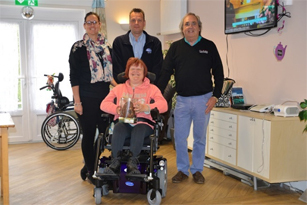 The reason was to deliver a brand new powerchair to our lovely customer Debbie Quartermaine. She opted for the Invacare TDX SP2 and she was very happy with her choice. This powerchair has excellent durability and ultimate performance. As you can see from the photo Debbie has chosen a purple powerchair but there are 6 other colour options to choose from. The Invacare TDX SP2 has great manoeuvrability whether you’re using it indoors or outside. It also boasts a highly adjustable seating system, meaning that it can be customised to your specific measurements. Debbie was also randomly chosen as the winner of our Facebook Easter competition. Her prize was a luxurious Easter Egg and a few other small chocolates. We are looking to run more competitions on Facebook and hope to have a range of prizes on offer. So, if you haven’t already, join our Facebook Page where we post regular updates, news, product offers and much more. The smile on Debbie’s face is what it’s all about for us. If you’re looking for any mobility solutions from bed & bath hoists to powerchairs and mobility scooters, then please contact us on (02392) 255600.